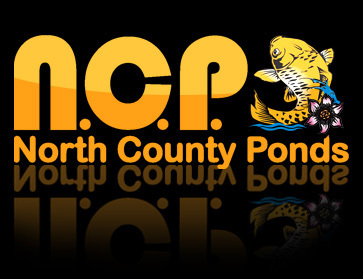 OUR COMPANY: North County Ponds is a reliable, honest, knowledgeable, affordable pond service company. Our maintenance staff has over ten years of pond cleaning, pond maintenance, and pond service experience. North County Ponds is a family owned business based out of North County, San Diego. We really love koi ponds and have developed a true passion for the hobby. 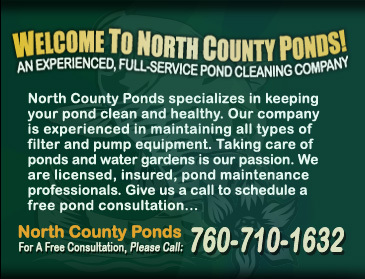 North County Ponds specializes in all aspects of pond cleaning, koi care, regular pond service, water garden maintenance, complete pond clean-outs, aquatic plant management, filter system cleanings, and much, much more! POND SERVICES: North County Ponds offers a wide variety of services for your pond, water feature, or water garden. We know what it takes to keep your pond looking beautiful! Our maintenance staff has over ten years experience in pond maintenance and fish care. We are knowledgeable in all aspects of pond upkeep including koi fish behavior, pond ecosystem management, the role of aquatic plants, and proper pond filter system care. Understanding the delicate balance of fish, plants, and pond water chemistry is the key to a clean, healthy koi pond habitat. Services include: Consultations, Regular Maintenance, Pond Clean-outs, Powerwashing, Pond Vacuuming, Muck Removal, Filter Cleaning, Pump Maintenance, U.V. Service, Algae Control, Aquatic Plant Management, Water Testing, and Koi Care. POND MAINTENANCE PROGRAMS: North County Ponds is a full service pond maintenance company that offers routine, regular pond service. Each pond is different and some ponds require more work than others. Based on your type of pond, our staff can determine which maintenance program would suit your needs. We offer weekly, bi-monthly, and monthly pond maintenance programs. POND CLEAN-OUTS: Pond owners and pond hobbyists know how quickly their beautiful koi pond or water garden can turn into an ugly, dirty, overgrown algae swamp. North County Ponds offers pond clean-outs for all types of neglected ponds. Large or small, liner ponds or concrete ponds, we are equipped for the job. Clean-outs consist of 100% water change, plant management/removal, powerwashing, filter/pump care, water conditioning, and bacteria boost. We can get your pond looking new again. POND EQUIPMENT MAINTENANCE: A key component to the overall health and aesthetics of your pond is the filter system. No matter what type of pond filter system you have, it is going to require either service or maintenance. North County Ponds is well versed in all types of filter equipment, pond pumps, and ultraviolet systems. It is very important to choose the correct equipment for your size pond. An inadequate filter system can create a lot of problems for your pond's ecosystem, while impairing your pond's overall aesthetics. KOI MEDICATING: North County Ponds is experienced in diagnosing and treating all types of common pond parasites, diseases, and illnesses. Koi medicating is tricky and there are no guarantees for a full recovery. We are proud to say we have successfully treated numerous ponds for many common ailments. If you think your pond is in need of medication or your koi look sick call North County Ponds at 760-710-1632 to schedule a consultation. POND DECORATION: Stone, rock, and aquatic plant life really adds to the beauty of your pond and are essential for a healthy pond ecosystem. Submerged, bog, or floating pond plants, have exotic seasonal flowers that are extremely rewarding for pond owners. Using potting techniques and effective use of nourishment, North County Ponds can get the most out of your aquatic pond plants. Enjoy the benefits of year-round blooms and manicured foliage growth. If your pond is new or old, large or small, North County Ponds is trained in a variety of pond care services including regular pond maintenance, on-call pond services, pond clean-outs, complete filter systems, pond water treatments, system cleanings, koi medicating, koi and fish care, algae control, aquatic plant care, and all other aspects of pond and lake management. Call North County Ponds at 760-710-1632 for questions, pricing info, or to schedule a free pond consultation. We are San Diego's choice for pond cleaning!